TAMPA, Fla. — Kat Lewis made yet another delivery, an armful of gowns, to a nonprofit helping foster kids. She heard about a new effort called Operation Prom Dress posted by the nonprofit Eckerd Connects. "I had a ton of dresses in my closet and I wasn't going to do anything with them they were just sitting there collecting dust," said Lewis. The member of the Junior League was inspired after seeing the post on Facebook. "So, I shared the post and I start calling on my girlfriends at the Junior League. They were only expecting about 20 to 30 dresses and I had 30 in my hands already. The power of social media is incredible," said Lewis. Nonprofits like the Voices for Children also saw the plea and pitched into help. Regan Quick stopped by with bags of donations Monday. "We rallied our troops and gathered the dresses," said Quick. The support was overwhelming, a call for just 30 gowns, led to more than 800 donated dresses, dozens of shoes, jewelry and purses. There is so much inventory they needed three rooms to store everything. And because of all of the surplus of supplies, the dresses are no longer just teens in foster care. Now, any girl in need can shop for free. It's all thanks to a simple post and a lot of shares. "I am so glad I saw it. All I could think about was when I went prom dress shopping with my mom and it was such a special experience," said Lewis. "That's great. That's wonderful all the more people we can help the better," said Quick. 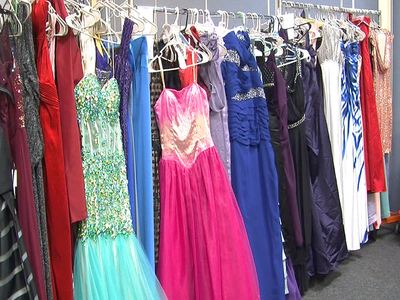 Anyone in need of a dress is invited to Eckerd Connects from 10 a.m. to 2 p.m. on Saturday, February 24 at 9391 North Florida, Tampa, FL 33612.